Pajarito Powder is a fledgling company that is about to move from the basement of the Farris Engineering Building into new space, but UNM has been a good place to develop a a powder that may someday replace platinum as a catalyst in fuel cells. Pajarito has been renting space and equipment at UNM and has hired Barr Halevi, research assistant professor in Chemical and Nuclear Engineering as the chief technical officer of the new company. The company has received initial venture capital from the Verge Fund, and Paul Short, the chief executive officer, is a serial entrepreneur associated with the fund. He's found a new home for Pajarito Powder and is putting together a facility to manufacture the powder in the I-25/Jefferson area. Pajarito Powder is working out a way to shape the physical and chemical reactions in fuel cells so they can consistently deliver electrical power over long periods of time via a controlled chemical reaction using a powdered catalyst. Current fuel cells use platinum as a catalyst, but platinum is extremely expensive, and since it comes mostly from South Africa, the U.S. government considers the supply chain to be vulnerable to political unrest. That is why the U.S. Department of Energy is a big driver in the research for find new catalysts for fuel cells. 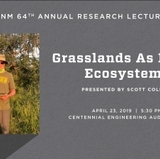 UNM is one of a group of universities that have been funded to do research in this area. Fuel cells are an attractive power source because they don't use fossil fuels. Short says Pajarito Powder sees two potential markets immediately. One is for cell phone towers, because Hurricane Sandy underscored the importance of reliable cell service and companies are searching for something more reliable than batteries to provide backup power for the towers. The other is materials handling – an industry term for forklifts. Most forklifts used inside warehouses today run on battery power, since they can't run combustion engines in enclosed spaces. But batteries run down and have to be recharged during the day. Fuel cells can run for longer periods of time, but they are expensive to manufacture. Pajarito Powder has optioned the licenses for two powder catalysts, one developed at UNM and one at Michigan State University, that work in small research quantities. 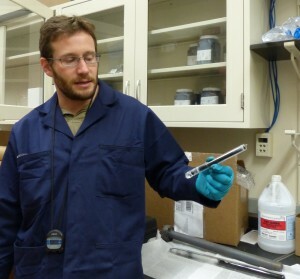 Halevi is concentrating on demonstrating that the Michigan State Powder can be manufactured in Industrial quantities. 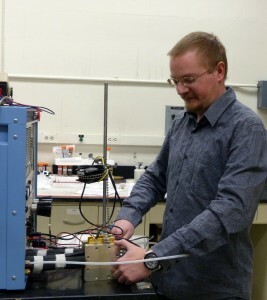 Alexey Serov, a postdoctoral researcher at the Center for Emerging Energy Technology at UNM is working to perfect the powder developed at UNM. Short says UNM has been very supportive in getting the company off the ground, as has Professor of Chemical and Nuclear Engineering and Director of CEET Plamen Atanassov. "The support here is superior, far superior. STC is great to work with. Plamen is great to work with. Alexey is great to work with. When I was down in the lab looking around, and asked whether anyone was interested in spinning out with a company, Barr volunteered before I finished the sentence." There is still a lot to be done. The company still has to demonstrate it can deliver the product that customers want. Short is hoping to be able to start shipping samples for companies to test in the next few weeks, and to have a manufacturing process in place and be shipping product within the next 18 months. 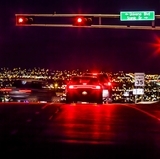 Developing a product for the alternative fuels market is always a gamble, but UNM and Pajarito Powder is hoping this one will be a great success.